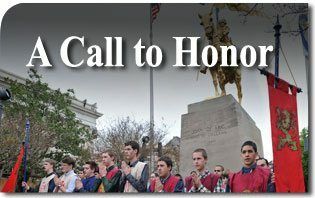 From April 1-4, a detachment of young men gathered at Fontainebleau State Park for the second TFP Louisiana Call to Chivalry Spring Camp near New Orleans. The joy of the Resurrection of Our Lord and His subsequent triumph over death permeated the ambience. The participants enjoyed a wide variety of games and talks. The theme for this year’s camp was Sowing the Seeds of Honor. John Horvat II, in his new book Return to Order: From a Frenzied Economy to an Organic Christian Society—Where We’ve Been, How We Got Here and Where We Need to Go, states the following about this subject: “Honor conveys the definition of an authentic esteem given to all that is excellent in a social atmosphere of respect, affection, and courtesy… Honor conveys the idea of values that cannot be bought and sold. It spreads the atmosphere of tranquility and temperance that we desire.” Honor was the golden thread connecting all of the camp activities. Two saints who served as role models for honor at the camp were King Saint Louis of France and Saint Joan of Arc. These two representative figures proved to be excellent examples to illustrate the theme of the camp. Informative talks about chivalry and the Middle Ages. In the talk on Saint Louis, the boys learned how he was able to set the standard for all times as the model of an honorable monarch. Under his vigilant and paternal reign, France became a land of great stability, where virtue and prosperity thrived. Bravely taking on the enemies of the Church, he led two crusades, dying shortly after embarking on the second. The boys later learned about the life of Saint Joan of Arc, who contrasted greatly with St. Louis. Saint Joan emerged during a time of great chaos and dishonor. She was given a prophetic mission by God to guide France through a terrible storm and restore honor to the nation. Her love for her kingdom, along with her militant chastity and combativeness, captured the hearts of the French people, and inspired them to expel the English invaders and finally bring an end the 100-Years War. All of Christendom eventually saw in her the saint who restored the ideals of chivalry. Continuing with the history of France, the next talk described the French Revolution. The young men learned to what depths of brutality, chaos, and depravity men can sink in a society that rejects God and has no honor. They were amazed to learn about the beheading of the sixteen Carmelite martyrs of Compiegne, the brave nuns who offered their lives to God to end the Reign of Terror. 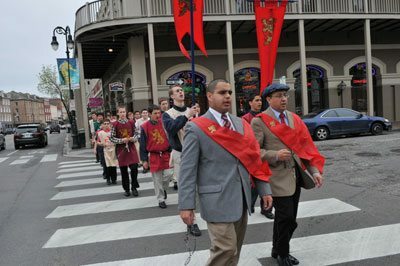 The six-mile walking pilgrimage in the city of New Orleans, from Saint Louis Cathedral to the National Shrine of Our Lady of Prompt Succor. 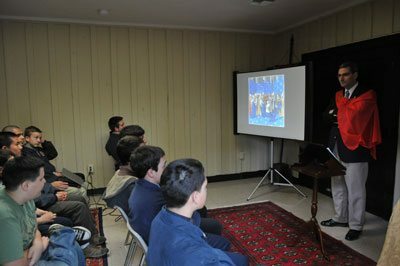 Rounding out the series of talks was a presentation about the necessity of devotion to Our Lady. In keeping with the camp’s theme, it was pointed out Our Lady is notably referred to as Vessel of Honor in the Litany of Loreto. The participants were encouraged to have confidence in the Blessed Mother, who will obtain for them the courage and integrity necessary to be men of honor if they humbly turn to Her in supplication. Concluding this year’s camp, and a highlight for both attendees and staff alike, was the six-mile walking pilgrimage the group made in the city of New Orleans, from Saint Louis Cathedral to the National Shrine of Our Lady of Prompt Succor. Heavy rains and lightning threatened to cancel the walk, but the weather broke and the pilgrimage prevailed. All prayed for the conversion of America and for the restoration of its honor. 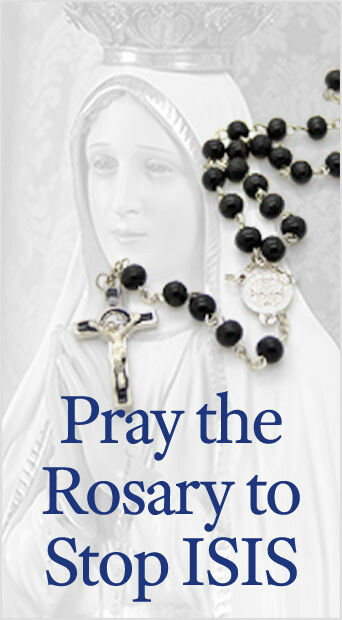 The TFP members and participants recited aloud the mysteries of the rosary and sang hymns as they advanced. People passing by were seen to pray along, wave, honk their horn or make the Sign of the Cross. Finally, all arrived at the shrine and offered prayers in front of the majestic statue of Our Lady of Prompt Succor. The pilgrimage concluded, it was soon time for the young men to say their farewells and return home, each resolving to do his part to restore honor to our society. May Our Lady of Prompt Succor hasten to help the United States to become a shining example of honor, leading the fight for the restoration of Christian civilization. This entry was posted in Events of 2013 and tagged 100-Years War, America, Blessed Mother, Call to Chivalry Spring Camp, Carmelite, Chastity, Christendom, Christian Civilization, Compiegne, English, France, French Revolution, God, honor, How We Got Here and Where We Need to Go, King Saint Louis, Litany of Loreto, National Shrine of Our Lady of Prompt Succor, New Orleans, nuns, Our Lady, Our Lord, pilgrimage, Prophet, Reign of Terror, resurrection, Return to Order: From a Frenzied Economy to an Organic Christian Society—Where We’ve Been, Saint Joan of Arc, Seeds of Honor, TFP Louisiana, United States, Vessel of Honor by Cesar Franco. Bookmark the permalink.